Travelling with Kids? Here’s the perfect hotel for you! If you’re looking for a vacation that the whole family can enjoy, may we suggest checking out Mesa’s largest entertainment hub, Mesa Riverview. 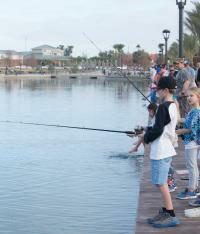 Sitting on the banks of the Salt River, Riverview offers fun for everyone. Stay at Hyatt Place Phoenix/Mesa, one of the most loved kid-friendly hotels in Arizona. Smack in the midst of Mesa Riverview, the Hyatt Place Phoenix/Mesa makes it an ideal stay for families looking for fun. Head over to Riverview Park, which features a 50-foot climbing tower, a 60 foot long caterpillar mesh rope climbing structure, and two playground areas. If you’re looking for a slower pace, check out the community fishing lake and enjoy the miles of paths that go around the recently renovated park. Oh and by the way, USA Today recently ranked Mesa Riverview Park as one of the top 10 parks in the U.S. If you’re looking for an awesome shopping experience, walk over to Mesa Riverview’s shopping complex for unique shopping and dining experiences fit for the whole family. Catch the latest blockbuster at Cinemark Mesa 16 or please the gamer in your family by heading over to Howie’s Game Shack, which features over 800 PC and Xbox gaming stations. After your fun-filled day, head back to Hyatt Place Phoenix/Mesa and enjoy their resort-style pool featuring 14 person hot tub, Shade and Mist Canopies with State of the Art Audio Visual System and 80" HDTV. Be sure to share your family fun with us using #MesaCityLimitless. We especially love photos of the view from the 50-foot climbing tower at Riverview Park.